Not so long ago the only way to restore the delicate eye area was by surgery both invasive and expensive – leading to time off for the tell tale signs to dissipate and a lot less in the bank account. Now however a few more of us can achieve the “less obvious signs of a life fully lived look” in a variety of aesthetic, anti ageing and genius ways! Lighten the dark circles -whether caused by one of the 3 main culprits – volume loss from ageing, pigmentation or visible blood vessels must be determined by the medical practitioner. 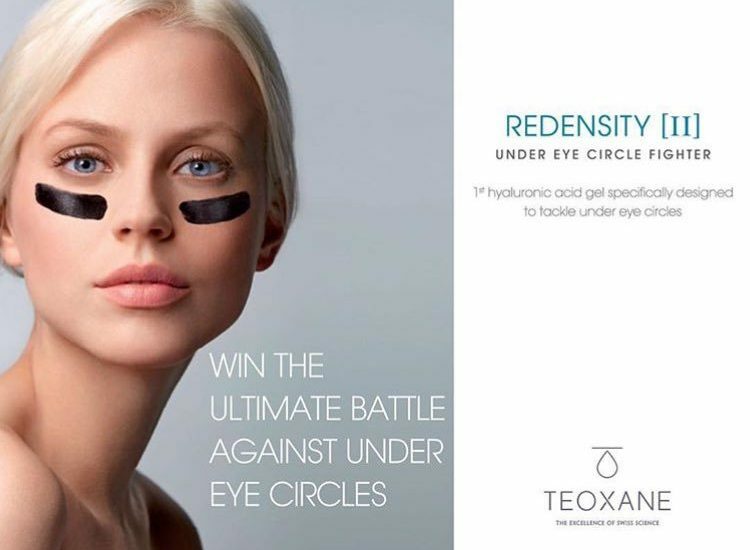 A tear trough treatment such as the Redensity 2 by Teoxane will fill the hollows and take away the shadows caused by this also leaving the surface of the skin tighter and smoother. However, if the shadows are caused by pigmentation then this is better cared for topically. Volume loss in other parts of the face can cause the under eye to look darker as well – sunken temples can make the eye area look hollow. Filler around the temples and cheek area will ease this shadowing plus giving some of the all important contouring as well which everyone is wanting. Treatment of the crows feet with a botulinium toxin will quickly rejuvenate and remove that crinkly eye look and of course regular treatments will stop the lines becoming static more quickly leaving you looking younger! With puffy eyes it may be worth having a look into allergies as these can cause the water retention a major cause before you look into anything else,! For everyone there are ways to say goodbye to tired old looking eyes.